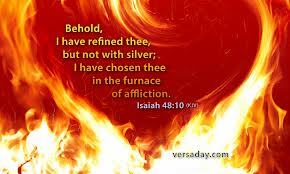 Welcome to Isaiah 48, I hope you enjoy reading this Book of Isaiah. But before we get right into Isaiah 48 let us give homage to our Lord and Savior Jesus Christ and after doing this we can read Book of Isaiah. 10 I have put you to the test in the furnace of suffering. I have tried to make you pure. But I did not use as much heat as it takes to make silver pure. 1 In the beginning was the Word, and the Word was with God, and the Word was God. He was in the beginning with God. All things came into being through Him, and apart from Him nothing came into being that has come into being. In Him was life, and the life was the Light of men. The Light shines in the darkness, and the darkness did not comprehend it . 48 People of Jacob, listen to me. You are called by the name of Israel. You come from the family line of Judah. You take oaths in the name of the Lord. You pray to Israel’s God. But you aren’t honest. You don’t mean what you say. 2 You call yourselves citizens of the holy city of Jerusalem. You say you depend on Israel’s God. His name is The Lord Who Rules Over All. He says, 3 “Long ago I told you ahead of time what would happen. I announced it and made it known. Then all of a sudden I acted. And those things took place. 4 I knew how stubborn you were. Your neck was as unbending as iron. Your forehead was as hard as bronze. 5 So I told you those things long ago. Before they happened I announced them to you. I did it so you would not be able to say, ‘My statues of gods did them. My wooden and metal gods made them happen.’ 6 You have heard me tell you those things. Think about all of them. Won’t you admit they have taken place? “From now on I will tell you about new things that will happen. I have not made them known to you before. 7 Those things are taking place right now. They did not happen long ago. You have not heard of them before today. So you can’t say, ‘Oh, yes. I already knew about them.’ 8 You have not heard or understood what I said. Your ears have been plugged up for a long time. I knew very well that you would turn against me. From the day you were born, you have refused to obey me. 9 For the honor of my own name I put off showing my anger. I hold it back from you so people will continue to praise me. I do not want to destroy you. 10 I have put you to the test in the furnace of suffering. I have tried to make you pure. But I did not use as much heat as it takes to make silver pure. 11 I tried to purify you for my own honor. I did it for the honor of my name. How can I let myself be dishonored? I will not give up my glory to any other god. 12 “Family of Jacob, listen to me. People of Israel, pay attention. I have chosen you. I am the First and the Last. I am the Lord. 13 With my own hand I laid the foundations of the earth. With my right hand I spread out the heavens. When I send for them, they come and stand ready to obey me. 14 “People of Israel, come together and listen to me. What other god has said ahead of time that certain things would happen? I have chosen Cyrus. He will carry out my plans against Babylon. He will use his powerful arm against the Babylonians. 15 I myself have spoken. I have chosen him to carry out my purpose. I will bring him to Babylon. He will succeed in what I tell him to do. 16 “Come close and listen to me. The Lord and King has filled me with his Spirit. People of Israel, he has sent me to you. 20 People of Israel, leave Babylon! Hurry up and get away from the Babylonians! Here is what I want you to announce. Make it known with shouts of joy. Send the news out from one end of the earth to the other. Say, “The Lord has set Jacob’s people free. They are his servants.” 21 They didn’t get thirsty when he led them through the deserts. He made water flow out of the rock for them. He broke the rock open, and water came out of it. 22 “There is no peace for those who are evil,” says the Lord. This entry was posted in Discipleship and tagged 3 “Long ago I told you ahead of time what would happen. I announced it and made it known. Then all of a sudden I acted. And those things took place. 4 I knew how stubborn you were. Your neck was as , and water came out of it. 22 “There is no peace for those who are evil, ‘My statues of gods did them. My wooden and metal gods made them happen.’ 6 You have heard me tell you those things. Think about all of them. Won’t you admit they have taken place? “From now o, ‘Oh, “I am the Lord your God. I teach you what is best for you. I direct you in the way you should go. 18 I wish you would pay attention to my commands. If you did, “The Lord has set Jacob’s people free. They are his servants.” 21 They didn’t get thirsty when he led them through the deserts. He made water flow out of the rock for them. He broke the rock o, ” says the Lord., come together and listen to me. What other god has said ahead of time that certain things would happen? I have chosen Cyrus. He will carry out my plans against Babylon. He will use his powerful arm ag, he has sent me to you. 17 The Lord is the Holy One of Israel. He sets his people free. He says to them, I did not do it in secret. When he comes, I will be there.” The Lord and King has filled me with his Spirit. People of Israel, Isaiah 48 New International Reader's Version (NIRV) Israel Is Stubborn 48 People of Jacob, leave Babylon! Hurry up and get away from the Babylonians! Here is what I want you to announce. Make it known with shouts of joy. Send the news out from one end of the earth to the other. Say, listen to me. People of Israel, listen to me. You are called by the name of Israel. You come from the family line of Judah. You take oaths in the name of the Lord. You pray to Israel’s God. But you aren’t honest. You don’t mea, pay attention. I have chosen you. I am the First and the Last. I am the Lord. 13 With my own hand I laid the foundations of the earth. With my right hand I spread out the heavens. When I send for them, peace would flow over you like a river. Holiness would sweep over you like the waves of the ocean. 19 Your family would be like the sand. Your children after you would be as many as the grains of sand, they come and stand ready to obey me. 14 “People of Israel, yes. I already knew about them.’ 8 You have not heard or understood what I said. Your ears have been plugged up for a long time. I knew very well that you would turn against me. From the day you wer, you have refused to obey me. 9 For the honor of my own name I put off showing my anger. I hold it back from you so people will continue to praise me. I do not want to destroy you. 10 I have put you to. Bookmark the permalink.